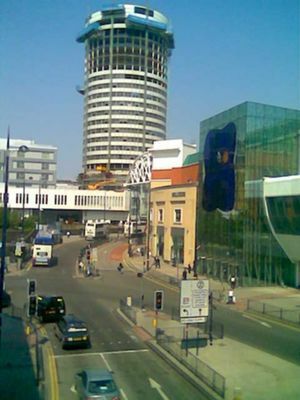 Birmingham , in the West Midlands, is Britain's second largest city (by local authority district). Known in the Victorian era, as the "City of a 1000 Trades" and the "Workshop of the World", Brum as locals call the city, is enjoying a 21st century resurgence as a great shopping and cultural destination. Birmingham (the h is silent, and, in the local dialect, the g is hard, as in Birming-gum) was at the heart of the UK's industrial revolution, and its wealth was built upon the multitude of trades that were spawned. This led to a massive canal network, with more miles of canals than Venice or Amsterdam (though they're very different types of canal). Much of the city centre was destroyed during the Second World War, and the replacement buildings added little to the city. However, since the 1990s, Birmingham has been undergoing a radical change and many of the post war buildings have been replaced. The majority of the city centre is now pedestrianized, and the canals cleaned up to make for attractive walkways. Locals credit the City Council for the recent transformation, as the city retains its industrial heritage while now appearing modern and forward looking. The city's notable associations are as diverse as HP Sauce, Tony Hancock, Cadbury's chocolate, The Lunar Society (whose members included James Watt and Matthew Boulton), Black Sabbath, UB40, Jasper Carrot and the Spitfire and the Mini (car, not skirt). Birmingham has many literary associations - not only JRR Tolkien, but also Washington Irving, who wrote Rip Van Winkle while lodging here with his sister's family, and Conan Doyle, who bought a violin in Sherlock Street while a medical student in Birmingham. The authors Jim Crace, Judith Cutler and David Lodge are also residents. The nearby locations of Shropshire, Warwick, and Stratford-Upon-Avon provide more of the stereotypical images of "olde" England. However, Birmingham has many of its own tourist attractions, has an extremely lively night life, and the shopping is arguably one of the best outside of London. Birmingham has a similar climate to the rest of Britain but with slightly cooler winters and warmer summers due to its inland position and relatively high altitude (200-300 meters or 700-1,000 feet). From December to February the weather is cold and temperatures typically range from 0°C (32°F) to 10°C (50°F) and there is a substantial amount of precipitation (around 200 milimeters). Snowfall is also comparatively higher than most of England; from 1971 to 2000 the Birmingham Airport averaged 13 days of snow cover annually while London's Heathrow averaged 5. Summers range from mild to cool with the average high in July being 21.3°C (70.3°F) and the average low being 12.1°C (53.8°F). The city does register some temperatures above 30°C (86°F) but extensive heat periods are quite rare. Summer is slightly drier than winter but there is still an average of 180 milimeters. Birmingham Airport (IATA: BHX) (ICAO: EGBB),  is situated just outside the city, in Solihull, about 8 miles east of central Birmingham, serving the city and the rest of the West Midlands region with frequent domestic and international flights. There are several direct arrivals a day from all major UK and European destinations, and one or two from more far-flung places such as Delhi, Dubai (twice daily), Islamabad, Luxor, New York and Toronto. A free Air-Rail Link connects the airport Passenger Terminals with Birmingham International Rail Station between 05:15 and 02:00; it runs every two minutes and the journey time is less than two minutes. From the Birmingham International Rail Station trains run to New Street Station every 5-15 min from around 6:15 (Su 8:45) to 23:15. The journey takes 10-20 min depending on whether you get an express or local (stopping) service and costs about £3 one way and only about 10p more for a same day return. Bus service X1 runs to Birmingham City Centre, the timetable varies depending on time and day but it can be viewed here https://journeyplanner.networkwestmidlands.com/Timetables. It runs 24 hours a day A single is £2.40 but a £4.60 daysaver gets you on all National Express West Midlands local buses for the day (£4 after 9.30am, discounts available for using a Swift Card or purchasing tickets on your phone). The 97 bus takes a longer route but also links to the city centre. Bus service 966 links the airport with Solihull and Erdington, 75 links Sutton Coldfield and Birmingham International Station, and 91 connects Chelmsley Wood and Birmingham International Station. A taxi from the airport to central Birmingham will take around 20-30 min and will cost around £22.00. Numerous National Express Coaches serve the airport during the day and prices are comparable to the bus service, handily services depart Birmingham's Digbeth Coach Station throughout the night which can be very useful for early flights. The National Exhibition Centre is adjacent to the airport and can be accessed by the Air-Rail Link in Terminal 1 via Birmingham International Station. Birmingham is a major hub of Britain's rail network and its main station has recently undergone a significant upgrade. The main station is New Street, with Snow Hill and Moor Street carrying significantly fewer services, but includes superior service to and from London Marylebone station, as well as serving different regional lines. New Street has faster, but more expensive, services to London that connect with Euston. New Street and Moor Street are a 5 minute walk apart, and Snow Hill is around 10 minutes walk from each. Some services run through both Moor Street and Snow Hill. Allow plenty of time to find your train at New Street station as it is very large. There are ticket barriers at all central Birmingham stations. Most platforms (tracks) are divided into sections (e.g. Platform 4A, 4B and 4C) and it's not uncommon for two trains bound for different destinations to depart from the same track, so make sure you wait in the right area and board the right train! There may be last-minute platform changes so it's advisable to keep close attention to the information screens and PA announcements as you may need to change platforms to the opposite side of the station. The station has a number of reasonably priced food outlets inside and is now a place where you can enjoy your connection rather than the dark station that existed prior to the rebuilding. Free toilets are available to passengers through the ticket barriers. Due to the layout of its platforms, if you are changing trains at New Street you are advised to use the B end of all platforms. This ensures you do not need to go through ticket barriers in order to get to your next platform. Inside New Street there is a transport information booth where you can purchase Swift Cards for use on buses, collect timetables and ask for directions. All areas of Britain are well-served, with half-hourly services (M-Sa daytime) from Bristol, Cardiff, Edinburgh, Glasgow, London, Manchester, Oxford, Sheffield and stations in between. Timetables can be checked at National Rail Enquiries  (0845 748 49 50) and booked online or over the phone through the train operator. National Express Coaches, will terminate at the newly rebuilt and modernised Birmingham Coach Station. The City Centre is around a 5 minute walk from the station along Digbeth High Street, the Selfridges Building and skyline are clearly visible to guide you in the correct direction. Birmingham Coach station has a booking office, two cafés, shop and other basic facilities. There are currently toilets (30p), vending machines (24 h), an internet cafe (£1/20 min) and information desk. There are half-hourly (or more frequent) services from London (service 420), and services from most major cities (including Bristol, Cambridge, Cardiff, Edinburgh, Glasgow, Manchester, Oxford and Sheffield) every two hours. If you are taking the coach to an airport (such as for your journey home), leave at least 3 h early, as coach trips have been known to face significant delays if mechanical or personnel problems are encountered. National Express promises only to get you to the destination within the same day and will take no responsibility if the service runs late (the optional National Express insurance covers only your personal safety and your possessions). Megabus goes all over England, Scotland, Wales and across to Europe with a quick change of bus at London Victoria. Prices start from £1 upwards and go from Hill Street (Near New St Station) Of the two National Express tends to have the best choice of destination and is usually more expensive. Megabus buses tend to be more comfortable these days though and are more likely to have plug sockets/Wifi. Neither company's drivers are particularly friendly or polite. Another coach option is Thandi's. They go from outside various Gudwaras around the Midlands and drop off in West London's Sikh heartland of Southall. They tend to be a lot friendlier than the two big companies! National Express, 0870 580 8080, . From the north, Birmingham is served by A-roads. From the north-east, use the M1, M42 and M6. From the east, use the M6. From the south-east, use the M40 and M42. From the south, Birmingham is served by A-roads. From the south-west, use the M5 and M42. From the west, Birmingham is served by A-roads. From the north-west, use the M6. Birmingham City Council operated car parks are available throughout the city, a list is accessible online . 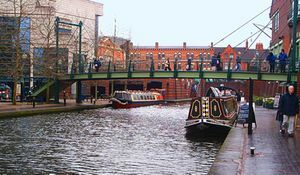 Due to its industrial heritage, Birmingham has an extensive canal network and is on both the "Worcester & Birmingham" and "Grand Union" canals. Visitors travelling by narrowboat can choose from several tourist moorings, managed privately or by British Waterways. Although the moorings are very busy in spring and summer, call ahead for availability. Birmingham Canal Information Centre, 42A Gas St, +44 121 632 6845 ([email protected]). Birmingham Canal Navigations provides a highly detailed 1:30,000-scale colour map of the network. Bus, Train and Metro all come under the authority of Network West Midlands (Part of Centro, the PTE of Birmingham and surrounding area), their website is the best source for all information required on public transport in the region . Birmingham City Council has public transportation information available online  as well. Birmingham is not a particularly cycle-friendly city (especially compared to the rest of Europe), but it is possible to get around without too much trouble. There are plenty of places to lock a bike up in the city centre, but few cycle lanes and lots of pedestrians. Unless you're touring the UK on pedal power, the best use for a bike is to do one of the following: explore the extensive canal network, enjoy the country parks, travel to out-of-town attractions, or experience more distant places such as Warwick, Leamington Spa and Stratford-upon-Avon. 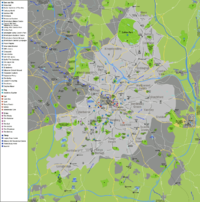 Birmingham City Council produces an excellent cycling and walking map of the area. You can pick one up from any local library, tourist information office, leisure centre or bike shop. Road and cycle path maintenance in the area is far from perfect, and it is not uncommon for trees and parked cars to obstruct the right-of-way. The standard of driving is as bad as in other cities, so exercise extreme caution on main roads and at night. The canal network can be accessed in the city centre from the Broad Street/Gas Street area, or at most road crossings elsewhere. The towpath is generally well-maintained to within a few miles of the city, and after that tends to be packed earth with plenty of mud and embedded bricks. A permit from British Waterways (free) is needed for towpath cycling. The Sustrans National Cycle Network  Route 5 (Oxford to Derby) passes through Birmingham from the south to the north-west. The local stretch is known as the Rea Valley Route, there is also the Cole Valley Route to the east. On Your Bike, 33-40 Bradford St, Birmingham +44 121 666 6933, ([email protected], fax: +44 121 666 6388), . M,W,F,Sa 10AM-6PM, Th 10AM-7PM, Tu,Su closed. There is no central bus station for local services, buses depart instead from various locations in the city centre (principally Bull Street, Colmore Row, Moor Street and Priory Queensway). Bus stop maps are available from libraries, tourist information offices and the Network West Midlands (NWM) office at New Street Station. Route maps and timetables are available from the outlets mentioned above, and there are extensive online versions on the National Express West Midlands and NWM  websites. If you do not have a lot of time to spare tracking down which buses serve which areas, you can use the Traveline Midlands Journey Planner  (0870 608 2608). Single fares are currently £2.40 for on NEWM services, valid on only 1 trip. However, for £4 (purchased after 9.30am) £4.60 (purchased before 9.30am) (Shops only sell peak time priced cards) you can get a day pass (daysaver) good on all NXWM buses until the end of service that day. NXWM buses do not give change, so make sure you have the exact amount required for the fare (in coins) ready when you board the bus. Buses end around midnight. Tickets can now be purchased on your phone or by using a Swift Card, both of which offer discounts. Details on prices and links to information about these methods is available here http://nxbus.co.uk/singles/. Group fares for up to 5 adults (or 2 adults and 4 children) are available for £8, or £5 after 6pm, again discounts on Mtickets and Swift card. National Express West Midlands operates a shop in the New Street train station (opposite the tram stop) which sells longer term tickets and Swift cards - there are also numerous agents around the City which sell bus passes. Avoid Monday mornings as the queue is out of the door from opening! Birmingham's bus system is roughly radial, with frequent services in and out of the city centre from most locations especially along the main radial routes, buses normally start from around 05:00 and finish at midnight. 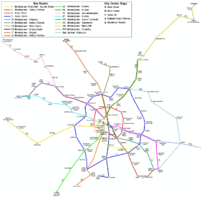 There are also two circular routes, the Inner Circle 8 and the better known service 11 Outer Circle, which can be useful while travelling between different areas and avoiding the City Centre. There are a few 24h bus routes, these are the X1, the 63, the 50 and the 74. There are also numerous services linking many suburbs, hospitals and shopping centres, on the whole these services are generally less frequent and some have no or poor evening or Sunday services. Unlike London, Birmingham has few bus lanes, though they are adding some, which can result in much longer journeys at peak periods. There are two buses which can be quite useful for travelling around the City Centre, NXWM provides a £1 City Hop ticket for travel within the city's inner Ring Road. These are:- 16 - links Digbeth Coach Station (departs from Barford Street opposite the gate which the coaches enter the station), the Markets, Moor Street, Priory Queensway, Snow Hill Queensway and Constitution Hill). 126 - links Broad Street, Paradise Circus, Navigation Street (for New Street Station), the Markets (a 5-10 minute walk from the Coach Station) and Moor Street. Birmingham's city centre is partially pedestrianised and has several unintuitive one-way systems. A car is a viable way of getting around the city and other areas, but a good map or sat-nav is essential. Birmingham City Council produces a map of city centre car parks (available from tourist information offices). Expect to pay £1-£1.50 per hour in Pay & Display areas and more on street meters. Parking attendants patrol popular areas regularly, so expect a fine if you return late or a clamp if you're parked illegally. Car hire is possible both in the city centre and at the airport. Motorcycles and mopeds are becoming increasingly popular in Birmingham as a way of avoiding rush hour traffic jams, and usually enjoy free parking in city centre car parks. Although not a lot of car parks have bike areas, there are a number of bays around the centre but none of them have any rails to lock your bike to. Birmingham has an abundance of taxi ranks all over the city, the best-served being New Street Station. Both hackney carriages and private hire vehicles are easy to find, but you should exercise caution and not get into an unmarked car or one you haven't booked. Friday and Saturday nights are the busiest times due to clubbers going home in masses, and there can be waits of over an hour if you're somewhere busy like Broad Street. AFJ Minibuses, Birmingham Minibus hire available 24 hours a day . Taxis Birmingham, Online Booking System . Airports Direct, 24hr Airport Taxis to and from Birmingham Airport. Castle Cars, 13 Oak Tree Ln, Selly Oak, +44 121 472 2222. Elite Radio Cars, Omnibus Garage, Harborne Ln, Selly Oak, +44 121 415 5000. Big Yellow Taxi LTD, Carpenter Rd, 32 B15 2JH, +44 121 440 7117. Uber operates in the city getting progressively less reliable the further from the city centre you go. 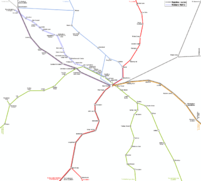 There is an extensive overland rail network serving most of Birmingham and the West Midlands area, operated mainly by London Midland. Route maps and timetables are available from libraries, tourist information offices, railway stations and the Traveline Midlands Journey Planner  (0870 608 2608). You can take bicycles, pushchairs and wheelchairs on board without prior reservation, and there is usually a designated carriage. Fares vary with distance, but you can expect to pay between £2 and £5 for a day return to a local destination. Fare-dodging is rife, and there has been a crackdown recently with ticket barriers at stations (cross-city line and Snow Hill) and on-board checking. The penalty for not having a valid ticket is a £20 on-the-spot fine (which can be contested in court, but is rarely worth the hassle). From New Street station, the cross-city line runs between Lichfield Trent Valley in the north and Redditch in the south, stopping notably at Sutton Coldfield (for Sutton Park), Aston (for Aston Hall), University (for the University of Birmingham), Bournville (for Cadbury World) and Barnt Green (for Lickey Hills). Local services also run to Hereford (via Worcester and Malvern), Leamington Spa, Northampton (via Birmingham International Airport, Coventry and Rugby), Nuneaton, Shrewsbury (via Wolverhampton), Stafford (via Walsall), Stratford-upon-Avon, Tamworth and Warwick. Additional services to these areas run from Snow Hill and Moor Street stations (they are on the same line), and you may not be able to catch a specific train from New Street. Birmingham has a single metro line, running between Snow Hill Station and Wolverhampton, via the Jewellery Quarter, West Bromwich, Wednesbury and Bilston. Plans are afoot to extend the service out to Five Ways, via the City Centre and along Broad Street. The Metro runs from roughly 6:30AM-11:30PM M-Sa, and 8AM-11PM Su and bank holidays. Fares vary with distance, but expect to pay around £2 for a single, £3.50 for a return and £4.50 for a day pass (combined bus/train/Metro passes are also available). Full route, timetable and fare information is listed on the Midland Metro website , and there is additional information on the Centro website . Water buses and taxis operate out of the canal offices in Gas Street Basin (underneath Broad Street). They also provide tours of the area. Obviously, they are limited to the local canals and are significantly slower than other forms of transport. Birmingham's City Centre is partially pedestrianised, and most things to see and do can be reached on foot. Birmingham walking directions can be planned online with the walkit.com  walking route planner. Visitors would enjoy the delightful walk from the International Convention Centre (ICC) and the Symphony Hall on the top of Broad Street to the Bull Ring shopping complex (the longest distance likely to be covered on foot), which would take around twenty minutes (not counting stops along the way) and may involve only one easy surface road-crossing. From the ICC, you walk east by the Repertory Theatre in Centenary Square; then literally through the Central Library to Chamberlain Square; with the Museum and Art Gallery to your left and the Class I listed building, the Town Hall, on your right, you make your way to the spacious Victoria Square. At Victoria Square, you will find the Town Hall to the west, the Council Offices to the north, and the Post Office to the South; the path you want to the Bull Ring is east, down New Street, which is a pedestrianized street lined with shops, stores, and kiosks. About five blocks down New Street, you will come to a signal at Corporation Street, the only road crossing you need to make on this walk. A few blocks later, New Street will turn into Rotunda Square. Bearing south towards St. Martin's Church, you will find the 21st-century Bull Ring Shopping Complex to your left and right. Birmingham has a large canal network. In the city centre, extensive development has enhanced the environment and level of amenities around these canals, making them excellent pedestrian routes in their own right. Visitors would enjoy the peaceful ten-minute car-free canal stroll from Brindleyplace, National Sea Life Centre, and Sherborne Wharf, all next to the ICC, eastward under Broad Street, through the Gas Street Basin, to The Mailbox (the former Royal Mailbox turned into shops and restaurants). Other walks in the City Centre include the wheelchair accessible summer Floral trail from The Mailbox to St Paul's Square, which in turn is the beginning point of another walk, the Jewellery Quarter in Bloom trail. Birmingham doesn't have a reputation for being especially picturesque, but there is a lot of interesting architecture in the city centre that the shops and crowds sometimes obscure. For such a (relatively) large population centre, the countryside (in the form of country parks) is surprisingly close. For a place with a strong industrial heritage, Birmingham does not have the large range of historical attractions you may expect, however, this is offset by the arts being extremely well-represented. While you're in the area make your way down to 14 Lodge Road, birthplace of Ozzy Osbourne. This is a private house (so please respect the occupants' privacy) but a popular photo-spot for heavy metal fans. Lodge Road is about 1/2 a mile from Aston Hall and runs between Witton Road and Trinity Road. Most crime in Aston occurs after dark so you should be fairly safe during the day. You'll also experience the inspiration behind Black Sabbath's grim early lyrics! There are small parks and green spaces all over the city and suburbs, and the countryside is only about thirty minutes away in any direction. The country parks and nature reserves usually contain a wealth of information about local flora, fauna and conservation efforts. Birmingham Botanical Gardens & Glasshouses, Westbourne Rd, Edgbaston (#22, #23, #24 or #29 bus), +44 121 454 1860 ([email protected]), . M-Sa 9AM-7PM, Su 10AM-7PM (Closes at 5PM or dusk Oct-Mar). Large botanical gardens with a huge range of plants and workshops throughout the year. £6.10 (concessions £3.60, family tickets available). Cannon Hill Park, Pershore Rd (#45 or #47 bus), +44 121 442 4226 ([email protected]), . Well-maintained park with flowerbeds, tennis, bowling and water features. Contains tea rooms and the Midlands Arts Centre. Free. Lickey Hills Country Park, Rednal (train to Barnt Green or #X62 bus), +44 121 447 7106 ([email protected]), . Popular park (heathland, coniferous forest and deciduous forest) covering over 200 hectares with a visitor centre, pub and golf course. Best visited in the spring (for bluebells) or autumn (for bilberries and turning leaves). Free. National Sea Life Centre, Brindleyplace, +44 121 643 6777 (24 hour information line +44 121 633 4700), . Daily 10AM-6PM (last admission 4PM M-F, 5PM Sa Su). Large sea life centre with a multitude of aquatic animals, including piranhas, turtles, sea horses, rays and otters. Feeding demonstrations throughout the day. £19.20 (concessions £6.95, family tickets available). Sutton Park, Sutton Coldfield (train to Sutton Coldfield or #66A bus), +44 121 355 6370 ([email protected]), . Enormous (over 900 hectare) park including heathland, wetland, marshes, woodland and lakes. Designated an English Nature National Nature Reserve in 1997. Lots of activities on offer including golf, angling, cycling and bird watching. Free. Woodgate Valley Country Park, Bartley Green (#23), +44 121 421 7575 ([email protected]), . 450-acre meadow, hedgerow and woodland park containing Woodgate Valley Urban Farm and Hole Farm Trekking Centre. Best visited in spring and summer when there are hundred of wild flowers and butterflies. Free. Birmingham's population is very diverse, and communities from just about any country in the world can be found somewhere. This is turn has led to numerous centres for all the world's major religions. Birmingham Buddhist Centre, 11 Park Rd, Moseley (#1, #35 or #50 bus), +44 121 449 5279 ([email protected]), . A centre run by the Friends of the Western Buddhist Order . Birmingham Cathedral (a.k.a. St Philip's Cathedral), Colmore Row, +44 121 262 1840 ([email protected]), . M-F 7:30AM-6:30PM (5PM from late Jul to early Sep), Sa Su 8:30AM-5PM. Church of England cathedral, built between 1709 and 1715 and the centre of the Diocese of Birmingham. Grade 1 listed building in the UK, designed as a parish church in the Baroque style by Thomas Archer. Contains four spectacular pre-Raphaelite stained glass windows. Birmingham Central Mosque, 180 Belgrave Middleway, Highgate (#35 bus), +44 121 440 5355, . Daily noon-30 minutes after Isha (exact time of Isha varies with the seasons). Built in 1969, Birmingham was the second purpose-built mosque in the UK (the first was Woking). The working capacity is 2500, though this is expanded during special events such as Eid. Tour groups should book at least two weeks in advance. UKIM - Jamia Masjid Sparkbrook, 179-187 Anderton Road and Sydenham Road, Sparkbrook (east), Birmingham, West Midlands, B11 1ND, +44 121 773 8651, . Daily Talks after Asar Salah. Birmingham Central Synagogue, 133 Pershore Rd, +44 121 440 4044 ([email protected]), . M Th from 7:15AM, Tu W F from 7:30AM, Sa from 9:30AM, Su from 8:30AM. Large modern orthodox synagogue, popular with students. Birmingham Peace Pagoda, Osler St, Ladywood, +44 121 455-0650, . The pagoda is designed as symbol of peace, compassion and the noble exemplary qualities of the Buddha. Ramgarhia Sikh Temple, Graham St, +44 121 235 5435. The Church of Jesus Christ of Latter-day Saints Harborne Ward, Lordswood Road +44 121 427-9291. Typical meetinghouse, with services at 10:00AM on Sundays. St Chad's Cathedral, St Chad's Queensway, +44 121 236 2251, . M-F 8AM-5PM, Sa 9AM-5PM, Su 9AM-1PM. Catholic cathedral built in 1841 and designated a Minor Basilica in 1941. Contains the Shrine of St. Chad. St Martin in the Bull Ring, between the Bull Ring shopping complex and the Bull Ring markets. 10AM-5PM. St. Martin is the parish church of Birmingham, or "The Cathedral of the Bull Ring", as some would say. The first church was probably Norman, but was rebuilt in the 13th century. As it stands today, most of the church dates from 1875, though inside you can see the 1325 effigy of the Lord of the Manor Sir William de Bermingham. The church is a Grade II* listed building in the UK. Shree Geeta Bhawan, 107-117 Heathfield Rd, Lozells (#46 bus), +44 121 523 7797, . M-Sa 9AM-1PM and 5PM-8PM (Tu 9PM), Su 9AM-8PM. Hindu temple, opened in 1967. Snobs, very similar to Ramshackle; with DJs offering more focus on up and coming music, also with a 60's room. "Big Wednesday"'s are big with the large student population Birmingham has, with shots at just £1 each all night. Risa, located on Broad Street, is one of the most popular clubs among students in Birmingham. Good fun on Monday and Wednesday night. Gatecrasher, now the biggest club in Birmingham, is on Broad Street. Rainbow Warehouse, A warehouse club next to the Rainbow pub in Digbeth which hosts a variety of underground events playing Dubstep, Drum & Bass, House and Techno. Check for events. PST, Located in Digbeth, PST is a private members club offering underground reggae nights. Check for events. Hare & Hounds, A live music venue located in the Kings Heath district, which has earned it's reputation hosting nightly events including artists and DJs across almost all musical genres. Bull's Head, A live music venue located in the Moseley district, the upstairs transforms into an intimate club environment open til 2am on Fridays & Saturdays. Concerts, theatre shows and other events are comprehensively listed and reviewed on Birmingham Alive! . Clue HQ - Birmingham Live "escape the room" experience in which guests, as a team, are given 60 minute to escape, finding as many clues as possible to solve a series of puzzles and riddles. The perfect exhilarating, entertaining and exciting team building activity. Birmingham's cinemas are quite reasonably priced due to stiff competition for the student market. Don't expect a huge range of "alternative" films, as even the independent places screen mainstream blockbusters to keep their revenues up. The Electric Cinema, 47-49 Station St, +44 121 643 7879 ([email protected]), . Daily, doors open 30 minutes before the film starts. The oldest still-operating cinema building in the UK (opening in 1909), famous for its Art Deco interiors, home baking and cocktail bar. The cinema now features sofa seating, waiter service and the best in intelligent mainstream and independent films. £6 (concessions £4, sofa seat £10). Midlands Arts Centre (MAC), Cannon Hill Park, Edgbaston/Moseley (#1, #45 or #47 bus), +44 121 440 3838 ([email protected]), . M-Sa 9AM-11PM (Su 10:30PM). The newly refurbished Midlands Arts Centre located in the leafy suburb of Edgbaston has a small but perfectly formed arthouse cinema £6 (concessions £4.50). The Giant Screen, Millennium Point, Curzon St, +44 121 202 2222, ([email protected]), . Daily 10AM-5PM. Part of the Thinktank science museum. 2D and 3D films shown on an enormous IMAX sized (five story) screen. Some mainstream films, mainly documentaries. £9.60 (concessions £7.60, children under 16 £7.60, family and joint Thinktank tickets available). Odeon, 220 Ladywood Middleway, Broadway Plaza, 0870 755 5657, . Daily 10AM-1AM. A large modern multiplex showing recent mainstream films. £5 (£3.50 concessions and before 6:30PM). Cineworld, 181 Broad St, 0871 200 2000, . Daily 10AM-1AM. A large modern multiplex showing recent mainstream films. £5.50 (£3.50 concessions and before 6:30PM, family tickets available). Odeon, New Street, 0871 224 4007, . Cinema showing mainstream films, near to Bullring shopping centre and New Street station. You can't really call it much of a multiplex. It is a 1930s building with very few screens and the seats are so close together your legs hurt after the advertisements! £5.20 (£4 before 5PM M-F). Vue, 29 Star City, 0871 224 0240, . Multiplex within the Star City entertainment complex north east of the town center (which also boasts restaurants, bars, nightclubs, bowling and a large casino). The cinema offers 24 screens, including 3 gold class screens with larger, more comfortable seats, at-seat service, free popcorn and a bar. £5.70-£6.60 (£8-£15 for gold class). A great way to pass an evening with friends in a friendly atmosphere and even pick up some useless trivia along the way. The Queens Arms, 150 Newhall Street, +44 121 236 3710, . A very popular city pub, a great place to watch live sport and the venue of the best quiz night in Birmingham every Thursday night. It's just £1 to enter and there's no limit on the size of the teams. A great night out for seasoned quiz-goers and first-timers alike. Birmingham hosts some of the largest events, exhibitions and conferences in the country, which may or may not be of interest to a visitor. National Exhibition Centre (NEC), Marston Green, Solihull (train to Birmingham International or #900 bus), 0870 909 4133 ([email protected]), . A huge exhibition centre, staging more than 180 exhibitions each year in 21 halls totalling 200,000 square metres. Free-£40 (price varies with event). NEC Arena, Marston Green (located within the NEC. Train to Birmingham International or #900 bus), 0870 909 4133 ([email protected]), . A 12,000-seat arena hosting national and international sporting and entertainment events. £6-£50 (price varies with event and seating). National Indoor Arena (NIA), King Edwards Rd, 0870 909 4133 ([email protected]), . A fairly large, modern arena hosting many national and international sporting and entertainment events. £6-£50 (price varies with event and seating). International Convention Centre (ICC), Broad St, +44 121 200 2000 ([email protected]), . A modern convention centre sharing a building with Symphony Hall. Birmingham has seen a rapid proliferation of lap dancing clubs in recent years, to the extent that they are now touted as a typical night out for business people. Around a dozen clubs are scattered over the city centre, including Legs Eleven (a favourite haunt of Premiership football players) and Spearmint Rhino. The live music scene in Birmingham is vibrant and varied, and something can be experienced just about any night of the week. Libraries, tourist information offices and music-related bars and shops will stock copies of The Fly or "Ryan's Gig Guide" free publications with exhaustive listings of every music event going on in the city and surrounding area. HMV Institute, 78 High St, Digbeth, +44 121 633 8311 (ticket line 0870 907 0999, . Having recently undergone a huge and lengthy restoration, HMV Institute is the new name for the old Sancutary and Barfly venues in Digbeth. Focusing on Alternative, pop and urban music The Institute has 3 arenas hosting gigs from local and touring bands. The venue also hosts regular club nights. Tickets £6-£25 (price varies with band fame). O2 Academy Birmingham, 16-18 Horsefair, Bristol St, +44 121 622 8850 (info line 0905 020 3999 (premium rate), [email protected]), . Relocated from its previous Dale End location, O2 Academy is a large music venue hosting many gigs from local and touring artists. The Venue has 3 separate arenas, O2 Acedemy, Academy 2 and Academy 3 and each venue may be open consecutively with up to 3 different gigs on some nights. The venue mainly focuses on alternative rock and indie. Weekend Gig tickets usually allow entry to the club night going on afterwards. £6-£25 (price varies with band fame). CBSO Centre, Berkley St (off Broad St), +44 121 616 6500 (ticket line +44 121 780 3333, [email protected]), . Modern rehearsal facilities for the City of Birmingham Symphony Orchestra (CBSO). Concerts usually once a week, including Centre Stage intimate chamber music. £5-£12. Flapper and Firkin, Cambrian Wharf, Kingston Row (near the National Indoor Arena), +44 121 236 2421, . M-Th noon-11PM, F Sa noon-midnight, Su noon-10:30PM. Friendly pub, popular with students. Live music Th-Sa from 8:30PM, usually underground rock, punk and indie. £4 (£3 with promotional flyer). In addition to the main venues mentioned below, there are several small theatres scattered around the city and the suburbs; pick up a What's On guide from a library or tourist information office for full listings. Alexandra Theatre, Station St, +44 870 607 7533, . Edwardian theatre showing pre- and post-West End plays and musicals. £6-£50 (price varies with seating). Birmingham Hippodrome, Hurst St, +44 844 338 5000 ([email protected]), . Large, recently refurbished theatre showing varied performing arts. Home of the Patrick Centre for the Performing Arts and the Birmingham Royal Ballet. Preferred venue for the Welsh National Opera. £6-£50 (price varies with seating. Concessions £3-£5 off or £10 student standby 24 hours in advance. 3%-6% transaction fee if not paying by cash.). Crescent Theatre, 20 Sheepcote St (off Broad St), +44 121 643 5858, . Box office M-F 4:30PM-7PM, Sa noon-7PM. Independent local theatre company performing both old and modern plays. £7-£12 (concessions £1-£1.50 off). Midlands Arts Centre (MAC). See Cinema. £5-£20. Old Rep Theatre, Station St, +44 121 303 2323 ([email protected]), . Home of the Birmingham Stage Company, puts on both professional and amateur productions. £5-£15. Repertory Theatre, Centenary Square, Broad St, +44 121 236 4455 ([email protected]), . Well-established theatre putting on classical and modern plays. Supports new work through The Door. £5-£15. Council-run leisure centres  are liberally scattered throughout Birmingham, typically offering swimming pools, sports courts, fields and exercise equipment, all available at much lower prices than you'd expect to pay at privately-run gyms. There's also plenty of golf courses, both municipal and private, across the city including the world famous Belfry complex. Villa Park, B6 6HE, 0871 423 8100 (). Home of Aston Villa F.C. . Birmingham's most successful football club having won 7 FA Cups, 7 league titles, and one European Cup. £25-35, capacity 42,786. Accessed with the Number 7 bus from the City Centre, or a train to Witton (don't be fooled, this is next door to the stadium) or Aston, a fairly long walk from the stadium, just follow the crowd, from New Street station. St Andrews, B9 4NH, 0871 226 1875 (). Home of Birmingham City F.C. . Birmingham's other main football club. Less successful than Aston Villa, with only 2 League Cups to their name, City have nonetheless maintained a strong fan base throughout the years. £15-30, capacity 30,016. Accessed from Bordesley train station, catch a train from Birmingham Moor Street, opposite the Bullring. Edgbaston Cricket Ground, B5 7QU, 0870 062 1902 (), . Home of Warwickshire County Cricket Club . Edgbaston hosts both county cricket matches and international test matches throughout the summer months. £6-£15 for Warwickshire games and £20-70 for Internationals, capacity 25,000. This is walkable from the City Centre, however, for a warwickshire Mid-week Day game, don't be at all surprised if you're the only one there. Alexander Stadium, Stadium Way, Perry Barr, B42 2LR, +44 121 344 4858 (). The Alexander Stadium, situated in Perry Barr, is Birmingham's only large athletics stadium and plays host to international meets and trials to decide the English/British teams for major events as well as being the base for the Birchfield Harriers  athletics club. The stadium's various sporting facilities are also open to public use. £1-2, capacity 7,000. Edgbaston Priory, Sir Harrys Rd, Edgbaston, B15 2UZ, +44 121 440 2492 (), . Edgbaston Priory is the main tennis club in Birmingham, with 29 tennis courts, 10 squash courts, 2 swimming pools and a gym available to the public. Every June the club also hosts the DFS Classic , a woman's tennis tournament that acts as a warm-up for Wimbledon. DFS Classic tickets £8-£20. The Belfry, Lichfield Rd, Sutton Coldfield, B76 9PR, 0870 900 0066 (), . The Belfry Golf Club runs three courses just to the north east of Birmingham, including the world famous Brabazon course which has been used for the Ryder Cup and continues to play host to tournaments on the PGA European Tour . Green fees £25-£140, tournament spectator tickets £7.50-£20. Grand Prix Karting, Adderley Rd South, B8 1AD, +44 121 327 7700, . Large go-karting centre just east of the city centre. £10-£50. The Ackers, Golden Hillock Rd, Small Heath, B11 2PY, +44 121 772 5111 (), . The Ackers is an outdoor activity centre offering a range of activities, ranging from kayaking and archery to rock climbing and dry slope skiing. Prices vary depending on activity. Skiing/snowboarding sessions £11 for one hour. Birmingham Speedway, Aldridge Rd, Perry Barr B42 2ET (Perry Barr Stadium), 0870 840 7410, . Open W 7:45PM. Come and see Premier League speedway racing every Wednesday. Drayton Manor, B78 3TW, 0870 872 5252 (), . Drayton Manor, located just outside Tamworth in Staffordshire, is the fourth most popular theme park in the UK, with 35 rides set in 280 acres of land as well as a 15 acre zoo. To get to the park during school holidays simply catch the special E22 bus in the mornings (typically just before 9 and 10) from Carrs Lane stop DK (near the Pavillions Shopping Centre). A return ticket should cost £10. Outside of school holidays you'll need to catch bus 110, which runs every half hour from Bull Street stop BF (near Snow Hill station) and get off at Fazeley. The return fare is £4. If you're unsure of where exactly the stop is (and it's easy to miss) ask the driver to signal you when you need to get off. Admission £18.95-£20.95. There are fifteen further education colleges dotted around the city, and community adult education centres in most suburbs. Most offer evening classes in a variety of academic and vocational subjects. There are also regular workshops at places such as the Midlands Arts Centre (see Cinema) and the Country Parks (see Parks and nature). Brasshouse Language Centre, 50 Sheepcote St (off Broad St), +44 121 303 0114, . M-F 9:15AM-8:30PM, Sa 9:15AM-1PM (holidays M-F 9:15AM-4PM). Specialist language centre offering courses in over 30 languages, from beginners up to degree level. Also offers TEFL, residential courses and distance learning. Birmingham is home to multiple universities, who enjoy a mostly-friendly rivalry (mainly fought out in the student press). Aston and Birmingham are campus institutions, with Birmingham City University spread out over several buildings and campuses around the city. There a few other, smaller universities that are not listed below, details of these can be found on wikipedia. Aston University, Aston, +44 121 204 3000, . Formerly the Birmingham College of Advanced Technology, became a university in 1966. Offers undergraduate and postgraduate courses in many subjects, but specialises in business and engineering. Aston Business School is widely regarded as an extremely prestigious MBA business school. University of Birmingham, Edgbaston (train to University or #21, #46, #61, #62 or #63 bus), +44 121 414 3344, . Large redbrick university, founded in 1900 and a member of the Russell Group of research-driven institutions. Offers a huge range of undergraduate and postgraduate degree courses. The picturesque campus is worth a visit, it contains the Barber Institure of Fine Arts, Lapworth Museum of Geology, Winterbourne Botanic Gardens and several art installations. Birmingham City University (Formerly: University of Central England (UCE)), main campus at Perry Barr (train to Perry Barr or #28A bus), +44 121 331 5000, . Formed from several colleges in the 1970's and adopted the University title in 1992. Offers undergraduate and postgraduate courses, specialising mainly in arts (BIAD at Gosta Green, Aston) and vocational subjects. Birmingham Conservatoire part of Birmingham City University. This high class institution specialises in refined music performance based degrees ranging from undergraduate to Advanced Postgraduate Diplomas and PhDs, and recently scored 3rd in student course satisfaction surveys across the UK's 9 music colleges as of September 2009. An ever growing number of well known names are stemming from the Conservatoire, such names have included Di Xiao, Christopher Orton and Rhydian Roberts. The vast number of shops, bars and restaurants in the city centre means that there is rarely a shortage of menial job vacancies. You will often see positions for minimum wage service or retail positions advertised in windows. There are also a lot of temping agencies able to find temporary office, driving and other jobs for travellers packing suits and CVs. Birmingham Broad Street Jobcentre, Centennial House, 100 Broad St, +44 121 480 3800. Birmingham City Jobcentre Plus, 65-77 Summer Row, Ladywood, +44 121 237 8300. During the last few years Birmingham has developed enormously as a regional shopping centre, with the old Bull Ring complex (once a notorious 1960's eyesore) being demolished to make way for a large shopping centre that includes Selfridges. There are also a number of lesser known shopping centres located near to the Bull Ring complex  such as the The Mailbox  and Grand Central , which is located directly above New Street Station. The principal shopping streets are New Street, High Street and Corporation Street. All include the usual assortment of high street chain-stores and discount outlets. The Pavillions has now been closed and is being renovated into a mega Primark, reportedly supposed to be the largest Primark in the UK. The Mall at the Pallasades has since been developed into the new Grand Central Birmingham , which currently houses around 55 new stores with few more to open in coming months. It was remodeled through 2015 and opened in September 2015, with opening times from 6.30 AM to 11 PM and most restuarants staying open until the very early morning. The shopping and cafe areas are on the top floor of Grand Central, and can be accessed either from its Broad Street entrance or through the Bullring, around the side of Debenhams. On the lower floor is New Street Station, which has been modernised with more organised platform entrances and exits to make it less confusing for travellers. Access to the station can either be from side roads off Broad Street or the top floor of Grand Central. Martineau Place is a small, recently developed shopping centre, which holds a Gap, H&M, O'Neill Store and Freespirit, as well as an obligitary Starbucks Coffee House. Birmingham's High Street has a different collection of stores, holding mainly discount stores, due to the attraction of the Bull Ring to larger name stores. However, New Street, going towards Victoria Square has many upmarket stores. As does the Mailbox, home to the region's only Harvey Nichols, as well as many other Designer Boutiques. The Jewellery Quarter , to the north of the city centre, specialises in jewellery and contains many small workshops and retailers. Bull Ring Markets, The Bull Ring, +44 121 303 0300 ([email protected]), . Indoor market M-Sa 9AM-5:30PM, Rag market Tu Th-Sa 9AM-5PM, Open market Tu-Sa 9AM-5PM. The markets comprise the original trading centre that Birmingham was built upon. There are hundreds of stalls, and you'll be able to get everything from food to underwear to gaffa tape relatively cheaply. Nostalgia & Comics, 14-16 Smallbrook Queensway, +44 121 643 0143. M-W 9:30AM-5:30PM, Th-Sa 9AM-6PM, Su noon-4PM. Comics, graphic novels, manga and the usual alternative oddities. Ideal if you want to catch up on your favourite series while on the road. Oasis, 112-114 Corporation St, +44 121 233 4488, . M-Sa 10AM-5PM. A large and intertwining collection of several small retailers over four floors, specialising in goth and alternative clothing and accessories. Cloggs.co.uk, Bull Ring Level 1, +44 121 643 8868, . M-Sa 10AM-8PM. An independent shoe retailer selling high street brands. Shared Earth, 87 New St, +44 121 633 0151, . M-Sa 10AM-6PM, Su 11AM-4PM. A fair trade company supplying hand-crafted stationery (brilliant for travel journals), clothing and oddities. New Street Farmers' Market, New Street (in the City Centre) . The market is held on the first and third Wednesday of every month, plus the second Wednesday in December. Other such markets are held in the suburbs of Moseley and Sutton Coldfield. The Frankfurt Christmas Market, . Every Nov/Dec, the city centre hosts this unique Christmas market which is the largest such market outside of Germany and Austria. Birmingham is the balti capital of England, as the balti was invented here in 1977. The much-promoted "balti triangle" covers around 50 restaurants on Ladypool Road and Stratford Road in Sparkbrook, about 2 miles south of the city centre. Travel West Midlands has a deal with eight of the larger eateries whereby you can get a 15% discount for travelling by bus, pick up a Balti Triangle by Bus leaflet for full details. A taxi to the area will take around 10 minutes and cost £5. Although the area looks a bit run-down, there is little crime as the abundance of restaurants ensure that the streets are always busy. Birmingham has a large student population, and the usual cottage industries have sprung up in campus areas to cater for their lack of cash. There are around a dozen cheap eateries in the Selly Oak area of Bristol Road, mainly Indian but also Chinese, Italian and English. The usual fast food chains, kebab shops and burger vans are also scattered around the city and surrounding areas. Simply Baguette, Opposite Wetherspoons, Corporation Street, you simply cannot miss out on this gem if you are travelling on a budget. A variety (and a big one at that) of baguettes ranging from 50-75p. An absolute bargain. Cafe Face, 519 Bristol Rd, Selly Oak, +44 121 415 4651. M-Su 8AM-6PM. Absolutely excellent cafes, big helpings not shy on the cheese, garlic mayonnaise and chilli sauce if you were to order them. Excellent reputation for their roasted vegetables or jacket potatoes. £3-£7. Canalside Cafe, 35 Worcester Bar, Gas St, +44 121 248 7979. Daily 9AM-4PM. Fairly small cafe with a good range of organic and vegetarian foods. Excellent in the summer, as it's (unsurprisingly) right on the canalside. £3-£12. Edwardian Tea Rooms, Chamberlain Square (inside Birmingham Museum & Art Gallery), +44 121 303 2834. M-Th Sa 10AM-5PM, F 10:30AM-5PM, Su 12:30PM-5PM. Authentic Edwardian cafe in the heart of the museum. The food is a lot better than the price suggests. £3-£12. The mid-range chain eateries are much the same as the ones you'd find in any British city but Birmingham has some fantastic independents. Buonissimo 1 Albany Road, Harborne, Birmingham B17 9JX +44 121 4262444 Friendly little Italian place off Harborne High Street. Good Italian food and fantastic value. Recently added a new summer menu. * The Plough, Harborne 21 High Street | Harborne, Birmingham B17 9NT +44 121 427 3678 A friendly gastro pub in the inner Southwest, lost it's way a little bit lately in terms of food and extremely expensive without a deal but they have some good offers hence Mid Range. * Original Patty Men 9 Shaw's Passage, Digbeth, Birmingham. B5 5JG Memorably describes itself as 'Patty Pimps & Purveyors of Filth', OPM was originally a pop up but progressed recently to it's own permanent location around the corner from Warehouse Cafe and is offering probably the best burgers in the city at the moment. They also offer a range of American style sodas. Recess Brindleyplace, 1 Brunswick Square, Brindleyplace, Birmingham, B1 2HW, +44 121 643 1005, . Alongside the restyled space we have put together some new foodie adventures for you to enjoy including small plates of classic rarebit and Portobello fries, indulgent sandwiches, large plates of chicken thighs with roast shitake mushrooms and chimichurri sauce, delicious burgers and classic steak and frites. Rectory Bar & Restaurant, 50-54 St Pauls Square, +44 121 605 1001, . Fabulous snack and sharing menu alongside a set price menu. Late bar every weekend and two for one cocktails every Thursday. £10-£20. Edmunds Lounge Bar and Eatery, 106-110 Edmund Street, +44 121 200 2423, . Famous for quality pub food from local suppliers. £8-£12. Chennai Delights, 813 Stratford Rd, Sparkhill, B11 4DA (part of the balti triangle, 4 miles south of the city. #5 or #6 bus), +44 121 778 5377. Tue-Fri 5PM-10:00PM (last orders), Sat-Sun 1PM-10:00PM (last orders),. Authentic South Indian food, cooked with traditional spices. Ask for Dosa's, Biryani, Paratta and Curry's. www.chennai-delights.co.uk £5-£10. Cafe IKON, 1 Oozells Square, Brindleyplace, +44 121 248 3226, . M noon-11PM, Tu-Sa 11AM-11PM, Su 11AM-6PM. Modern cafe attached to the art gallery with efficient and friendly staff. Excellent muffins. £6-£20. Cafe Soya, Unit 2, Upper Dean St, +44 121 622 3888. Popular Chinese and Vietnamese place and not exclusively vegetarian, despite the name. £6-£20. Celebrity Balti Restaurant, 44 Broad St (above the Brasshouse pub), +44 121 643 8969. Decent Indian dishes. £12-£35. Chung Ying Cantonese Restaurant, 16- 18 Wrottesley St (off Hurst St), +44 121 622 5669. THE Chinese Restaurant in Birmingham, established since 1981. Opposite Arcadian Centre. £10-£35. Chung Ying Garden, 17 Thorp St (off Hurst St), +44 121 666 6622 ([email protected]), . Large, well-known Cantonese place. Huge menu, always full of Chinese people. Also offers private rooms for groups, karaoke and disco. £10-£40. Hudson's, 122-124 Colmore Row, +44 121 236 9009 ([email protected]), . Independent cafe with tailcoated waiters, also a luxury gourmet food retailer. Bookcrossing venue. £5-£20. Pasta Di Piazza, 11 Brook St, St. Paul's Square, +44 121 236 5858, . Daily noon-midnight. Upmarket Italian place, can be a bit crowded. £12-£30. Thai Edge, 7 Oozells Square, Brindleyplace, +44 121 643 3993 ([email protected]), . Daily noon-2:30PM and 5:30PM-11PM. Contemporary Oriental surroundings. Wide range of Thai dishes. £12-£40. The Green Room, Arcadian Centre, Hurst St, +44 121 605 4343 ([email protected]), . M-W 11AM-11PM, Th 11AM-midnight, F Sa 11AM-2AM, Su noon-12:30AM. Varied contemporary menu, chilled-out atmosphere. Popular with the theatre crowd. £10-£30. V2, 73-75 Pershore St, +44 121 666 6683. Home-style Chinese cooking, popular with the local Chinese community. Clean and bright inside with trendy decor. Wagamama, Bullring plaza, (under Borders), B5 4QL, +44 121 633 6033. . M-Sa Noon-11PM, Su12:30PM-10PM. Birmingham's restaurant of the Wagamama chain, tidy and minimal inside with a good, varied noodle menu. Specials change frequently and there are a few good vegetarian dishes. Can get busy, with a typical wait from 10-15 minutes during peak shopping times. The Kitchen Garden Cafe, 17 York Road, Kings Heath. . Picturesque area in the middle of a busy and bustling part of Birmingham, where you feel right at home the minute you walk in. Quality vegetarian options and excellent service. This is one of those places that, in time, will only get better. Birmingham has quite a few upmarket places, mainly due to the number of high-rolling businesspeople that drift in for conferences and other dealings. Aria Restaurant, 2 Bridge St (In Hyatt lobby), +44 121 643 1234, . Daily 6:30AM-10:30PM. 3-course pre-concert table d'hôte menu. Rectory Bar & Restaurant, 50-54 St Pauls Square, +44 121 605 1001, . quality steaks, fresh fish, set price menu and superb wine list. £15-£20. Metro Bar & Grill, 73 Cornwall St, +44 121 200 1911, . Seasonal seafood, pasta, salads and cocktails. £15-£40. Opus Restaurant, 54 Cornwall St, +44 121 200 2323 ([email protected]), . Non-smoking shellfish bar. £15-£40. The Jam House, 1 St. Paul's Square, +44 121 200 3030 ([email protected]), . Varied menu and live music most nights. £20-£50. Considering its size, Birmingham does not have a wide range of vegetarian-specific places to eat. Nevertheless, because of the multicultural nature of the ciy, vegetarian and vegan options are widely available to cater to the dietary requirements of the city's inhabitants. All the eateries mentioned above will have vegetarian options, but the Indian and Chinese places tend to have better variety. If you are vegan ask for your balti/curry to be cooked without ghee (clarified butter). Naan breads are generally not vegan whilst rotis are. Jyoti, 569-571 Stratford Rd, Sparkhill (part of the balti triangle, 4 miles south of the city. #5 or #6 bus), +44 121 766 7199. Tu-F 6PM-9:15PM (last orders), Th F noon-2:30PM, Sa Su 1PM-9:15PM (last orders), closed M. Excellent Indian food, but relatively small portions. Extremely popular, so book ahead. £5-£20. The Warehouse Cafe, 54 Allison St, Digbeth, +44 121 633 0261. Tu-F noon-12:30PM, Sa noon-3PM, F Sa 6PM-9PM. Wholesome organic vegetarian and vegan fare. Closely linked with Friends of the Earth. £5-£20. Chennai Dosa, 169-171 Hagley Road, Edgbaston +44 121 454 1111. A popular restaurant serving South Indian cuisine, which is known for it's Dosas. Has vegan options. £5-£10. Mr Singh's All Vegetarian Pizza, 103 Cornwall Rd, Handsworth Wood, +44 121 552 3529. Vegan and vegetarian pizza restaurant. £5-£10. The city and suburbs have the usual assortment of supermarkets, newsagents and corner shops. The city centre is especially well-served, with three Tesco, two Sainsbury's and one Somerfield outlets. A great place to pick up cheap food (including fresh fruit and veg) is the Bull Ring Market (see Buy). Day In, The Arcadian Centre, +44 121 622 6182. Chinese supermarket with a wide range of Asian foods. One Earth Shop, 54 Allinson St, Digbeth, +44 121 632 6909. M-Sa 10AM-5PM. Specialty vegan wholefoods and other ethical essentials. Selly Oak is in South Birmingham and has its own train station with frequent services from Birmingham New Street. It can also be reached by buses, which stop along the Bristol Road. The University of Birmingham is located close by, and hence the majority of residents in Selly Oak are students, who live in terraced houses mainly in a rather poor state. The shops and services on Bristol Road cater for the student population. There are many take-aways / junk food places, letting agents, off-licenses, cheap restaurants and pubs. The Soak Very cheap and decent food available, as well as a wide range of drinks. Gun Barrels Very studenty pub with pool tables and the like. Quite big. Cheap drinks. Very popular with students, gets very crowded on some nights. Has a large beer garden. Part of the Scream chain. Recently closed to make way for a new swimming pool. The Bristol Pear Again part of the Scream chain but much smaller than the Gun Barrels. Cheap drinks. Khanum Indian restaurant. Very good. Cheap. You can bring your own wine. Chamon Indian restaurant. Pretty good. Cheap. You can bring your own wine. Cafe Eastern Delight Pretty Indian restaurant. You will have about 5 waiters behind your back if you eat there. Suzen's Noodle Bar Food often too oily. Cheap. Rimini Italian restaurant. Prices higher than usual in the area, but quality of food and presentation is usually better than most local restaurants. You can bring your own wine. Pizza Land / Mama Wia / Luciano's All little shops that serve very cheap (but good) pizza cooked by people who probably get paid less than the national minimum wage. Dolphin Chip shop situated on Raddlebarn Road. Do not even think of venturing in there. They served me chicken that tasted of fish, as they clearly cannot be asked to change the oil. Selly Sausage Popular cheap student restaurant. Good for paninis, pancakes, omelettes and the like. Host of "the campus mate" - a dating section by the local student newspaper. Kebab Land Name says it all. Rooster Hut closed down as bigger, better and cheaper Rooster House opened across the road. Good chicken at low prices. Adam's Place Usual range of junk food at low prices. Big John's Usual range of junk food at low prices. Has been refurbished and now looks slightly more fancy. Woodstock Formerly a nice place with great atmosphere. Since the shop changed owner in early 2009 it has got much less cozy and the food is not as tasty as before. Still very high reputation. Dress code restrictions are rather common in Birmingham clubs, so be careful to check out each club's policy. Many clubs refuse to admit large groups of males in case of trouble, so go individually or in small groups. The usual excuse that door-staff give is that someone in the party is wearing the wrong type of shoes/coat/trousers etc. The general rule of thumb is no effort, no entry. This usually means shoes, not trainers, and a shirt, not a T-shirt. At the same time being dressed like that can be a hindrance, if you go to one of the cooler bars. It's best to check with someone who's been to the particular bar before. There are a number of areas in the city centre, which are defined below, but other areas to look for a night out are Digbeth, Kings Heath, Moseley, Harborne and Selly Oak. If you are looking for the average drink, virtually any pub or bar will do. If you are a real ale aficionado, there are several excellent pubs to visit, where dress restrictions do not usually apply. Bull, 1 Price St, B4 6JU. +44 121 333 6757. Quiet and comfortable pub, in the Gun quarter. Figure of Eight, 236 Broad St, B1 2HG. +44 121 633 0917. Large city centre pub belonging to the Wetherspoon chain. Bacchus, Burlington Arcade, B2 4JH. +44 121 616 7991. Cheerfully insane ornate, gothic style cellar bar beneath The Burlington Hotel. Discretely hidden just off the bustling New Street. Bacchus is a relaxing oasis away from the buzz of the City Centre. A range of real ales is available. Craven Arms, Upper Gough Street +44 121 643 6756. Situated out of the rear of the Mailbox complex, has great traditional blue tiled exterior. Rectory Bar & Restaurant, 50-54 St Pauls Square, +44 121 605 1001, . Ideal venue for both drinking and dining with a fabulous reputation for food. The bar is vibrant every weekend and is open to 1am. It's a stylish place but friendly and attracts a great mix of people. The Queens Arms, 150 Newhall Street, +44 121 236 3710, . A very popular city pub, a great place to watch live sport and the venue of the best quiz night in Birmingham every Thursday night. Great place for traditional ales and a Cask Marque award winner. Edmunds Lounge Bar & Eatery,106-110 Edmund Street, +44 121 200 2423, . Popular venue in the financial part of town, great food available every day. Old Fox, 54 Hurst St, B5 4TD. +44 121 622 5080. Old Royal, 53 Church St, B3 2DP. +44 121 200 3841. Single bar with large-screen TV. The pub is popular with office workers. Those looking for a cheap student night could do worse than check out Snobs which plays a mix of indie music. Every two weeks an indie night called Resurrection  is held at Subway City. Sobar — Supposedly a noodle bar, as evidence by a small noodle based menu. Really this is just a pretty decent bar. It stocks the standard beers and drinks as well as a number of rarer Asian beers. Has a number of extremely comfortable sofas. Bamboo — One of the best, but also one of the most pretentious clubs in Birmingham. Its not cheap but is still the place to be seen. The dress code here is very hard to define, they want "cool". Revolution — Chain vodka bar. A cut above the normal broad street crowd, though it does get crowded. Great range of Vodkas. The Pitcher and Piano — Canal side bar with a decent range of beers. Perfect for a nice lunch time drink in the summer months, sitting outside by the canal. The Prince Of Wales, King Edward St (behind the I.C.C. 2 minutes from Broad St). Victorian pub with decent menu & many types of fine ales, worth a visit for the beer! Birmingham has a large Irish community and many Irish pubs. Most of the city centre ones are spread along Digbeth High Street beginning with The Bullring Tavern near the Bull Ring and finishing with The Rainbow near Camp Hill. Anchor, 308 Bradford St, B5 6ET. +44 121 622 4516. Victorian pub near Digbeth Coach Station. Grade II listed. Woodman, 106 Albert St, B5 5LG. Phone: +44 121 643 1959. Grade II listed. Opposite the Thinktank at the Millennium Point. Every two weeks an indie night called Panic! is held at the Sanctuary in Dibgeth. For a more eclectic mix of music and people take a look at the Medicine Bar in the Custard Factory just off the A34 in Digbeth (it's the big blue building). Just around the corner is a club called Air, host to nationally recognised nights such as Godskitchen . The Custard Factory, Gibb Street, Hosts a range of nights, from Drum n Bass to Electro, not to be missed. The Rainbow Pub, An ecclectic pub that hosts a variety of nights, one of the best places in Birmingham and is soon to be shut down. Also visit the Rainbow Warehouse, around the corner which is big on the rave scene and often joins with the Rainbow pub to host street parties such as S.L.A.G. Birmingham has a vibrant and visible gay scene centered around Hurst Street . Every Spring Bank Holiday this area, often referred to by locals as the Gay Village, hosts a free gay-pride festival while its bars and clubs attract people from across the Midlands all year round. Hurst Street is well policed and homophobic attacks are rare, though the local fundamentalists may try to 'save your soul'. Birmingham is as gay friendly as Manchester, Brighton, and Blackpool. Birmingham has a large number of gay venues, the best being the Village, Eden, Equator, The Loft Lounge and the Queens Arms. The Fountain and Bolts are men only bars. Many of the more up-market bars and restaurants are located on St. Paul's Square and in the Jewellery Quarter. This is also home to the Jam House, Birmingham's premier jazz club. Round the corner is The Queens Arms, 150 Newhall Street, +44 121 236 3710, . A very popular city pub, a great place to watch live sport and the venue of the best quiz night in Birmingham every Thursday night. The Vaults, Newhall Place, Newhall Hill, +44 0121 212 9837, . Impressive looking bar with vaulted brick ceilings in the basement of Birmingham's oldest surviving workhouse. The Rose Villa Tavern, 172 Warstone Ln, +44 0121 236 7910, . Well preserved historic pub built in 1919-1920 and given a trendy refurb in 2011. Serves good real ale and cocktails. Harborne was once a separate village, is now a mainly residential area a bit North of Birmingham University. The old village center, along Harborne High Street, now has a lot of pubs with a mixed crowd; students, faculty and others. There's a tradition among the crazier students; try to have a half pint in every pub in Harborne in one evening. With over 20 pubs and several km of walking involved, and the limited opening hours of British pubs, this takes some doing. Bell Inn, 11 Old Church Rd, B17 0BB. +44 121 427 0931. Next to St Peter's Church, this cosy and quiet pub gets busy because of its attraction. The Plough, near the East end of the high street Birmingham, cosy, moderately priced, popular with medical and nursing students. "The Junction" on the High Street. An odd V shaped pub as the name suggests on the junction of the High Street and Vivian Road. A really nice pub sells some real ales and good selection of lagers. Sells good pub grub as well. If you want a more social feel to your stay why not try one of the two very good hostels the city has to offer. Birmingham Central Backpackers, 58 Coventry St, Digbeth, +44 121 643 0033, . Birmingham's only independent hostel features a central location only streets from The Bull Ring, and next to the nightclubs of Digbeth. Beds in a shared dorm can be found for as little as £9 if you've got a sharp eye out and both breakfast and various foods in the evening are included, making it the West Midlands only half-board hostel. It is in the oldest part of the city, right near where the original manor house once stood. The area can look a little uninviting (this is what you will find outside the very centre of this industrial city), but the hostel makes up for it by being socially inviting (films/football can be watched and they have a Wii, playstation and xbox) and, as mentioned, still being close to The Bull Ring. They offer nightly events such as quiz night, beer tasting, movie nights and disco, and the common room is probably the best around. Hatters Birmingham, 92-95 Livery Street, Jewellery Quarter, +44 121 236 4031, . Less than a 10 minute walk to the centre, Hatters Birmingham have upped the norm in hostel accommodation boasting all ensuite rooms and, finally, after eight long months of waiting (yet advertising that it was there) they've got a common room. Beds start from £14.50 and includes bed linen & a free light breakfast which is served all day. Hotel du Vin, 25 Church Street, Birmingham  Luxury hotel in Birmingham city centre offering luxurious rooms and suites, fine dining, pub and a bistro. Bilberry Hill Residential Centre,  — for groups looking for accommodation in the scenic Lickey Hills, but with easy access to the centre. Cheap hotels are now being found in the city centre, one of them is The Etap Hotel, £35 per night for a double bed and single bed or The Paragon Hotel, prices starting at £45, 145 Alcester Street, +44 121 627 0627. There are also Ibis aplenty starting from £49 per night. Awentsbury Hotel, 15 Serpentine Rd, Selly Park (close to the university), . Offers mid-range B&B in a quiet environment within 10 minutes walk from the university. Britannia Hotel, city centre (close to the university), . Offers mid-range accommodation for business and travelling guests. Hilton Garden Inn Birmingham Brindleyplace, 1 Brunswick Square, ☎ +44 121 643 1003, . Located in the Brindleyplace Development in Birmingham. Offers a restaurant, bar, meeting venue and event offers. Hampton by Hilton Birmingham Broad Street, . Contemporary 3 star hotel offering 285 stylish rooms, free WiFi and complimentary breakfast. Holiday Inn Express Birmingham Oldbury M5, Jct 2, . Where comfort meets great value rates, all guests receive free WiFi in public areas and a complimentary breakfast to set you up for your day. Crowne Plaza Birmingham, Holliday St, (in the city centre), +44 020 79 37 93 (not enough digits), . Hyatt Regency Birmingham, 2 Bridge St, (in the city centre), +44 121 643 1234 . Linked directly to the International Convention Centre (ICC) and is 5 minutes from the National Indoor Arena (NIA). Birmingham Marriott Hotel, 12 Hagley Rd, (in the city centre), 0870 400 7280, . Radisson Blu Hotel Birmingham, 12 Holloway Circus, (in the city centre), +44 121 654 6000, . The national dialling code for the city is 0121, followed by a three digit area code, followed by a four digit number. A fully specified Birmingham number will be in the format 0121 000 0000. The minimum dialling requirement is 000 0000 within the national dialling code area. BT payphones are dotted around the city, and most will take both cash and credit/debit cards. International calls are by no means cheap. There are no telephone centres, so if you're going to be making lots of calls home a pre-paid phone card may be a good option. All GSM mobile networks have excellent coverage in all areas of the city. All public libraries provide free internet access. It is also possible to get online from some BT payphones in the city centre (look for the ones with light blue broadband signs on them). Wi-Fi is available in a number of cafes and other places, including the Bull Ring. As with the rest of the UK, in any emergency call 999 or 112 (from a landline if you can) and ask for ambulance, fire or police when connected. In general, Birmingham is a safe city. However, like most large cities, there are some good and bad areas. Certain suburbs (see below) have had their share of gun crime problems, but these are extremely unlikely to affect you unless you make yourself part of the larger drug gang problem. Avoid any offers of cheap drugs as you might be lured into a secluded place and then robbed. Muggers in Birmingham tend to operate in groups of two or three, typically one will ask you a question (to judge whether you are local or likely to hit back) while the others move in behind you so they can force you to the ground. If you find this happening to you, then move to the side, so you have a clear escape path and cannot be grabbed from the rear. The city centre is well-policed. The only trouble you might witness is a small scuffle on the Broad Street nightlife quarter as the nightclubs turn out in the early hours of the morning. However, take care at either end of Broad Street where the traffic flow speeds up. It is advisable to stay away from the city centre when football matches between the city's two professional teams occur. Aston Villa and Birmingham City have a violent and raw hatred for each other, and violent clashes between supporters of both teams are a common occurence on match days. On other days, when the teams are playing at home against other teams, it is a little less unlikely for major violence to occur in the city centre, but you may encounter pubs full of chanting football supporters, and this may be intimidating for tourists. As usual, common sense will keep you safe, avoid walking alone in deserted or poorly-lit areas, especially at night, keep your wits about you at cash machines, and do not get into unmarked taxis. The only higher crime-rate areas that tourists might want to visit are Aston and Sparkbrook: even these are fairly safe during daylight. Canal towpaths at night, if relatively near a road access point, can also be hazardous. Every Friday and Saturday night, unofficial motor-races take place around the city centre ring-road (Queensway). Be aware of the danger that it presents to other road users. Steelhouse Lane Police Station, Steelhouse Ln, 0845 113 5000 ([email protected]). Daily 24 hours. City Hospital (A&E), Dudley Rd (#80, #82 or #87 bus), +44 121 554 3801. Daily 24 hours. Queen Elizabeth Hospital Birmingham (A&E), Mindelsohn Way (train to University or by bus http://nxbus.co.uk/west-midlands/links/hospitals/queen-elizabeth-hospital/), +44 121 627 2000. Daily 24 hours. Birmingham has a separate children's hospital and the majority of paediatric services are provided at this location. There is an A&E with a well stocked toy supply (either for distracting the injured or for occupying any additional accompanying children!) and if medical attention is necessary parents or guardians may prefer to take their children to this A&E where possible as it is designed specifically for children. Birmingham Children's Hospital (A&E) Steelhouse Ln (20 minutes walking from New Street Station, 15 from Moor Street and 5 from Snow Hill. Multiple bus routes, information here http://nxbus.co.uk/west-midlands/links/hospitals/birmingham-childrens-hospital-) +44 121 333 9999 Daily 24 hours. If you are injured enough to need medical attention but do not need to attend A&E there are a number of drop in medical centres in the city. Serving the city centre, the aforementioned Boots on High Street provides a wide variety of medical services. Away from the city centre you can consult this website for details on your nearest drop in centre http://www.nhs.uk/Service-Search/Walk-in%20centre/LocationSearch/663. Virgin Trains is the main operator of trains between London and Birmingham with trains every 20 minutes and a journey time for around 1 hour 20 minutes. They are operated by fast (up to 125mph) and modern Pendolino trains. These can be cheap if you get an Advance fare from £5 single, but if you are buying tickets on the day or there are no cheap tickets left, it may be worth using one of the two other operators listed below. Chiltern Railways  and London Midland run frequent half-hourly/hourly services between Birmingham and London. These take noticeably longer than Virgin Trains, 2 hours - 2 hours 20 minutes, but cheap flexible tickets at around 1/2 of the Virgin Trains price can be bought at any time. For example an Off-Peak adult day return ticket from London to Birmingham costs £15 (Super Off-Peak) with London Midland, £19.50 (Super Off-Peak) with Chiltern Railways, but £40.40 with any operator, including Virgin Trains. Both Megabus and National Express run several services an hour to London, and competition has lowered the cheapest fares to £1 or less. Liverpool, the birthplace of the Beatles, is a vibrant cosmopolitan city with a vast array of shops, bars and restaurants. Its world famous waterfront with the magnificent Albert Dock, along with its numerous museums of national importance, its wealth of fine Victorian and Georgian buildings and its two very contrasting cathedrals, and the chance to ride on the world famous Mersey ferry make Liverpool well worth a visit. You can get to Liverpool in around 1 hour and 40 minutes by train. The M5 will take you to the south-west, either the M42 then M40 or the M6 then M1 will take you to London and the south-east. In the other direction the M1 will take you to Leeds and the north-east. The M6 will also take you towards the north-west, Liverpool, Manchester and Scotland, or, via the M54, to north Wales. This page was last edited on 13 March 2019, at 08:48.